Washington - Gone are the Bojangles fried chicken and biscuits. When supporters offer Tex-Mex, she takes a salad. And forget about cake (most of the time). 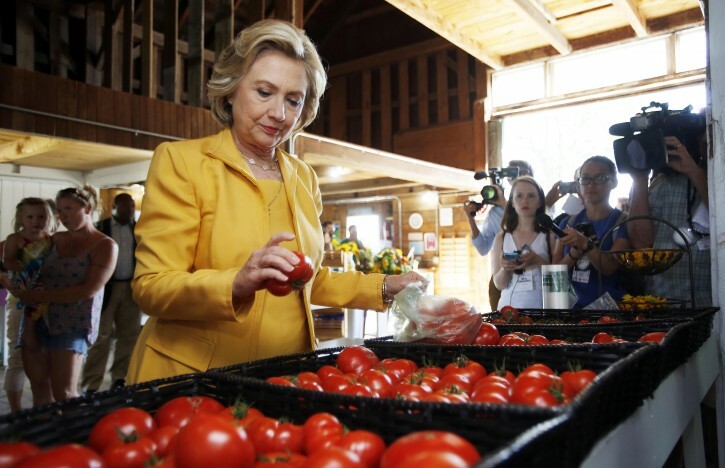 As Hillary Clinton knows from previous presidential campaigns, politicking means picking your food carefully. 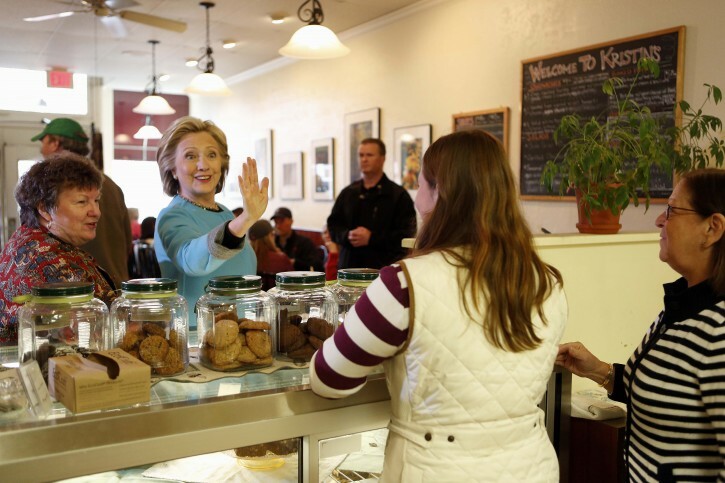 When her staff laid out a spread of pulled pork and beans from Whole Hog Cafe after a stop in Little Rock, the Democratic front-runner ate a single tomato slice. Though she forgoes a Fitbit to count her steps, Clinton sends her campaign team to scout out secluded tracks for brisk walks and hotel rooms with space for yoga. And she swears by the weight-loss power of hot peppers, keeping red pepper flakes on hand when on the road. Since launching her 2016 bid in April, Clinton has embarked on a diet and fitness regimen, hoping to stave off the pounds that afflict most every White House hopeful amid the near-sleepless nights and temptation of nonstop snacking during a campaign. Among supporters, her significant weight-loss — along with a style makeover — are subjects of constant chatter. All candidates have their tricks for staying fit while hustling for votes. President Barack Obama has often complained about the fried food that is a staple of campaign stops and is a regular at the gym, even when traveling. Kentucky Sen. Rand Paul avoids fries. Republican Jeb Bush is a devotee of the Paleo diet, claiming to have lost 40 pounds by cutting carbs and dairy. But no politician’s looks have been scrutinized as long or as intensely as Clinton’s, whose appearance has been a topic of conversation for decades. Former and current staffers describe her food tastes as surprisingly normal, saying she snacks on cheddar Goldfish crackers. While she would occasionally indulge when she campaigned for fellow Democrats during the 2014 elections, snacking on fried chicken and Mexican food, Clinton has now adopted more discipline. Dining with supporters in Washington earlier this month at Etto, an Italian restaurant known for its wood-fired pizzas, Clinton opted for a cauliflower salad. Clinton has been fairly candid about the struggles of eating right during her time in public life and has over the decades met with a series of nutrition gurus. In the 1990s, with low-fat diets on the rise, she invited Dean Ornish into the White House to lighten up the presidential menu. Eventually, Clinton fired chef Pierre Chambrin, known for his butter-laden French fare, and hired Walter Scheib, who specialized in lower-fat food — and would agree to provide meal-by-meal calorie counts. Any diet that Clinton tried, Scheib did, too. Many of their meals centered on fish and vegetables. Clinton favored hummus, had a collection of more than 100 hot sauces and a weakness for mocha cake and Dove ice cream bars — a favorite of daughter Chelsea. After leaving office, both Clintons flirted with the low-carb South Beach diet before meeting Mark Hyman, the director of the Cleveland Clinic Center for Functional Medicine, who advocates for a mix of whole foods, proteins and natural fats. But some campaign rigors call for special indulgences. After her 11-hour testimony before congressional Republicans in October, Clinton took a quick break from calorie-counting. Look at the idiocy the left wing mainstream media focuses on when it comes to the lying criminal Hilary. But when it comes to the republicans they're as critical as can be...n o wonder Americans are so fed up with the left! Go get that female vote Hilary, you will need it. at least she can do one thing correct, chose food. Is Clinton really ugly, or does her inner ugliness just make us think she's ugly? Those are two ways to describe the same phenomenon.